Join hosts Devin and Joe, who live in the middle of nowhere, as they talk about all of the things they love and hopefully the things you love too. What is a nerd? Someone who loves D&D, sci-fi, fantasy, and video games? While we at Nerds From Nowhere may love all of these things, we like to think of a nerd as someone who is passionate about something. So whether you are a sports nerd or a Star Wars nerd, a fishing nerd or an anime nerd, a music nerd or a science nerd, we want to share that passion and excitement with you. Join us as we discus all facets of nerd culture, even the ones you wouldn't normally associate with nerds. The nerds talk about what video games they have been enjoying and why and then talk about what threats Space Force might encounter. On this thrilling episode the nerds discus what has what the influence of science fiction on technology of technology on science fiction. They also talk about one of their favorite subjects......FOOD! And as always, their future excitement and current addictions. The nerds talk about Stan Lee, the Venom movie and answer a bunch or random questions. They also talk about their current addictions and future excitement. The nerds take part in a special fund raiser episode for Extra-Life with their friends from ThreadRaiders. Join your nerd hosts as they talk about some scary, Halloween related topics such as possibly frighting movies and shows, ghost stories, aliens sighting and/or abductions (or maybe just prostate exams) and so much more! Also, they talk about their future excitement and their current addictions! Episode 21: The Chickens are the Key! The Nerds talk about Russian Hackbots, doomsday scenarios, and the key to saving humanity itself! On this weeks episode the nerds talk about time travel in movies. Then they discuss which is better, sci-fi or fantasy. And of course, their current addiction and future excitement. The nerds interview Hollywood actor Ronnie G. Blevins, an actor with more than 100 acting credits in film and television. He usually gets cast as a bad guy, but in real life, you couldn't meet a nicer guy. The nerds talk with Maxine, that girl from that place, to discuss her acting career and theater life in general. Join us for a detailed look at what makes dreams, and how to make them come true. The Nerds are joined by Nils from Nerd Therapy Podcast to talk about their D&D actual play podcast, which character is better, Bert or Ernie and what we think of all the trails that came out of San Diego Comic-Con. We also talk about our current addictions and future excitement. 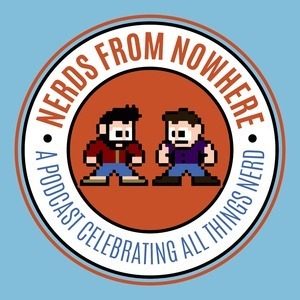 On this episode the nerds talk to special guest TK. They talk about table top gaming, and specifically TK's love of the game Shadowrun and how he streams his own game on Twitch. TK explains, to Joe's disbelief, why Ninja Turtles was his favorite NES game. They also discus taking things apart and in the case of TK, being able to put it pack together again. And of course their current addiction and future excitement. On this first ever live-streamed episode, your nerd host Devin shares a D&D story time! The nerds talk about the good times back at old school arcades. As always, the nerds share their current addiction and future excitement. Special guest Chaotic Anarachy from the Thread Raiders Podcast stops by to hang out and liven up the place. We discuss what the Thread Raiders are and how the group aims to spread good will and acceptance amongst the world. We then have a conversation about our favorite announcements from E3 2018 and as always, our future excitement and current addictions.